Did you ever wonder what Florida would look like in the future? Curious as to the conditions in the U.S. after years of world-wide war, plague, and terrorist attacks? Can one cop make a difference? James O'Neal's fascinating futuristic cop novel, The Human Disguise, is a riveting speculative novel, a story set "More than twenty years from now." Let's set the scene. There was a ban on immigration in the U.S. eleven years earlier. An amnesty bill gave citizenship to everyone who was inside the borders. Since the country was fighting two wars, there were 27 million citizens taken in on one day, and then most were conscripted into the military. Every September 11th, terrorists attack somewhere in the U.S. The plague and famine have wiped out enormous numbers of people, and there are quarantine zones in the U.S. Homeland Security is the only federal agency left. There are emissaries from Jupiter on the way to Earth. Germany is threatening war again. And, in South Florida, there is a Unified Police Force because cities can't afford their own police departments. It's even too expensive to send out crime scene investigators unless a victim's family paid. Tom Wilner has been a cop in this devastated section of Florida for six years. And, if he hadn't been sitting in a bar watching the wife who left him, and her boyfriend, Tiget Nadovich, he wouldn't have witnessed the unusual fight in which men who were fatally wounded actually survived. That one bar fight triggers suspicions in Wilner's mind, and that of another cop and friend, Steve Besslia. But, while Wilner, a down-to-earth cop, focuses on the investigation, and the unusual involvement of two men who don't seem to get along, Nadovich and Johann Halleck, Besslia has a wild idea that they're dealing with aliens. As the case gets murkier, with missing circuit boards, unusual suspects who seem to heal themselves, and his suspicions that his wife may be involved, Wilner is initially reluctant to trust a Homeland Security agent, Shelby Hahn. It isn't long, though, before Wilner realizes he, Besslia and Shelby may be the only ones knowledgeable enough to stop the complete destruction of what's left of South Florida. Fan of science fiction? O'Neal's speculation as to the future of Florida and the world is scary because of the real possibilities. If you think humans aren't the only race here, you'll appreciate The Human Disguise. If you're a fan of crime fiction, you'll enjoy the crime investigation twenty-some years from now. O'Neal has successfully combined crime and science fiction, but his true success is Tom Wilner. He's a family man who lost his wife, but is doing his best to take care of his children. And, it's hard not to feel sorry for Wilner, a man determined to protect people, and do his job, despite his own confusion and uncertainty as to what is actually happening. Tom Wilner is a hero, a cop forced to look beyond The Human Disguise. 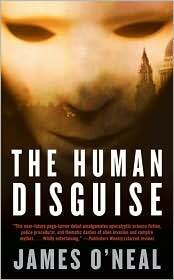 The Human Disguise by James O'Neal. Tor, ©2010. ISBN 9780765359773 (paperback), 381p. This is a crime novel set in the near future. Don't worry about the science fiction aspect. You can read it as a straight crime fiction novel with a different setting. Doesn't hurt to try it! This sounds like some interesting genre blending--I like the idea of the SF with the crime fiction. Sounds like a fun read. It was fascinating, Elizabeth. I could just imagine the U.S. in the conditions described in this book.